"Avangate enables Retrospect to provide both partners and end-users in more remote regions in-country purchase option where there may not be a portal to source our product. 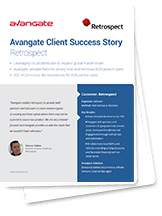 We are very channel focused and Avangate provides us with the reach that we wouldn't have otherwise," Werner Walter, Director of Sales, Americas, Retrospect. Retrospect is a laeading systems backup, recovery and optimization solution dedicated to providing reliable Windows and Mac tools and support for professionals and small-to-midsize businesses. More information on www.retrospect.com. Retrospect benefits from close relationships with value added resellers that sell the back-up software as part of a managed service package. Extend reach to new and more remote markets, maintain ownership of the end-customer relationship for more effective up-selling and cross-selling, engage with local resellers and deliver the product trainings and sales and marketing materials needed to better sell Retrospect’s products and services..